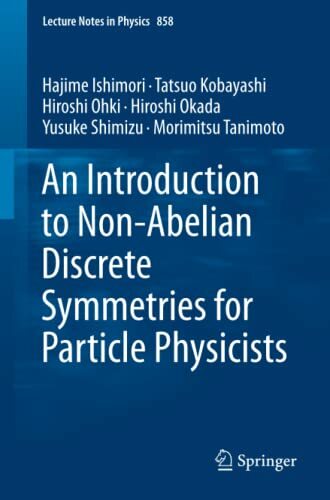 [PDF] An Introduction to Non-Abelian Discrete Symmetries for Particle Physicists (Lecture Notes in Physics, Vol. 858) | Free eBooks Download - EBOOKEE! Description: These lecture notes provide a tutorial review of non-Abelian discrete groups and show some applications to issues in physics where discrete symmetries constitute an important principle for model building in particle physics. While Abelian discrete symmetries are often imposed in order to control couplings for particle physics - in particular model building beyond the standard model - non-Abelian discrete symmetries have been applied to understand the three-generation flavor structure in particular. Indeed, non-Abelian discrete symmetries are considered to be the most attractive choice for the flavor sector: model builders have tried to derive experimental values of quark and lepton masses, and mixing angles by assuming non-Abelian discrete flavor symmetries of quarks and leptons, yet, lepton mixing has already been intensively discussed in this context, as well. The possible origins of the non-Abelian discrete symmetry for flavors is another topic of interest, as they can arise from an underlying theory - e.g. the string theory or compactification via orbifolding â€“ thereby providing a possible bridge between the underlying theory and the corresponding low-energy sector of particle physics. This text explicitly introduces and studies the group-theoretical aspects of many concrete groups and shows how to derive conjugacy classes, characters, representations, and tensor products for these groups (with a finite number) when algebraic relations are given, thereby enabling readers to apply this to other groups of interest. No comments for "[PDF] An Introduction to Non-Abelian Discrete Symmetries for Particle Physicists (Lecture Notes in Physics, Vol. 858)".